With the new year only a few weeks in and many people trying to lose that extra holiday weight, now is a good time to consider the long-term effects of weight gain—packing on some extra pounds can mean a lot more for your body than no longer fitting into your favorite jeans. The new year may have you motivated to get healthy, but unfortunately most new year’s resolutions dissolve by mid-February, and 80 percent fail altogether. Instead, try turning that new year’s resolution into a long-term lifestyle change. Many health problems stem from excess weight, meaning that their effects can be reduced—or prevented altogether—by paying attention to your weight on an ongoing basis. Your heart, your joints and your gut all belong to the same body, after all. Heart disease is caused by high cholesterol and blood pressure levels, which are often caused by excess weight (in addition to smoking and high stress levels). When your blood pressure is high, your heart has to work harder than usual, causing damage to your arteries over time. Losing 5 to 10 percent of your overall weight can significantly improve your chances of developing heart disease, as it improves blood flow and lowers cholesterol levels. Osteoarthritis is the most common type of arthritis, which occurs when the protective cartilage in the joints is worn down over time. Excess weight can contribute to this by regularly placing extra pressure on said joints and cartilage, especially in the knees, hips, and lower back. Losing at least 5 percent of your overall weight can decrease this pressure and reduce inflammation, significantly reducing the symptoms or risk of developing osteoarthritis. Type 2 diabetes, formerly known as adult-onset diabetes, is presumed to be caused by being overweight and inactive—your body becomes resistant to insulin, which is a hormone that helps the body regulate blood sugar levels. More than 87 percent of adults with diabetes are also overweight. While there is no known cure for diabetes, losing weight and becoming more physically active can prevent or reduce the symptoms. If you have decided to make efforts to lose weight, keep in mind that you should be focusing on your body mass index, or BMI, rather than a specific number on the scale, as it measures body fat according to one’s height and weight. 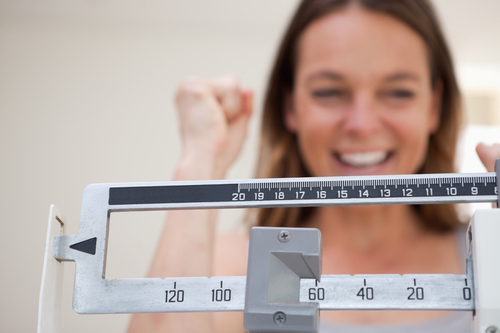 According to Centers for Disease Control and Prevention, a normal or healthy weight range is a BMI of 18.5 to 24.9. Anything below that is considered underweight; 25.0 to 29.9 is considered overweight, and anything above that is considered obese. Staying healthy doesn’t have to mean incorporating a drastic lifestyle change, but small modifications can be successful. Healthy weight loss is gradual and steady—1-2 pounds per week—with realistic diet and exercise modifications. According to a study through the National Weight Control Registry, participants with significant weight loss demonstrated improvements in physical health, energy levels, mood, and confidence.